As summer comes to a close I want to spend more time outside and less time in my kitchen. What can I make quickly, without turning on the oven and only using the freshest of peak season farmer’s market vegetables? Gazpacho! Besides, It’s Meatless Monday! 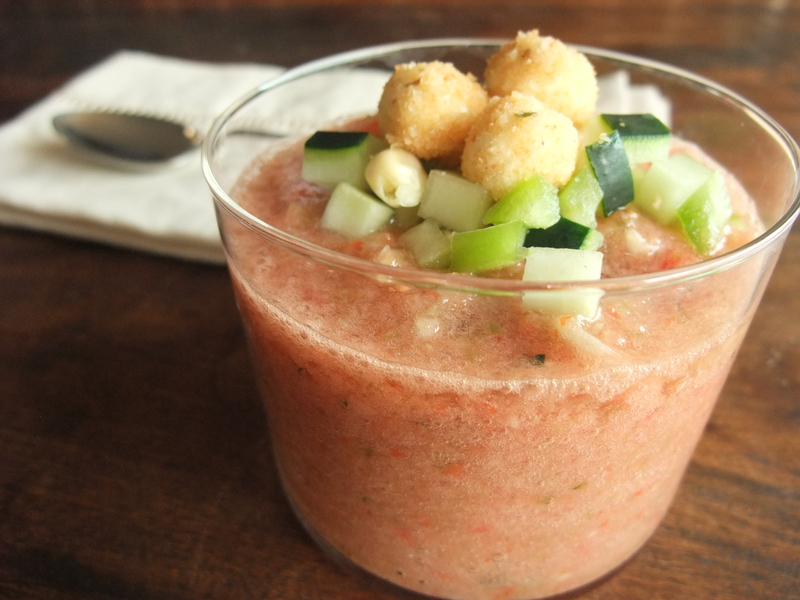 Gazpacho is a traditional cold Spanish soup usually consumed during summer months. It has an interesting history. It is thought to have been brought over by the Moors or the Romans. The soup included using stale bread, garlic, olive oil, salt, vinegar, and water. When tomatoes were brought to Spain they were at first thought to be poisonous. It wasn’t until a famine in Italy 200 years later forced some peasants to consume tomatoes. Since they didn’t die from it, tomatoes were then embraced all across Europe. 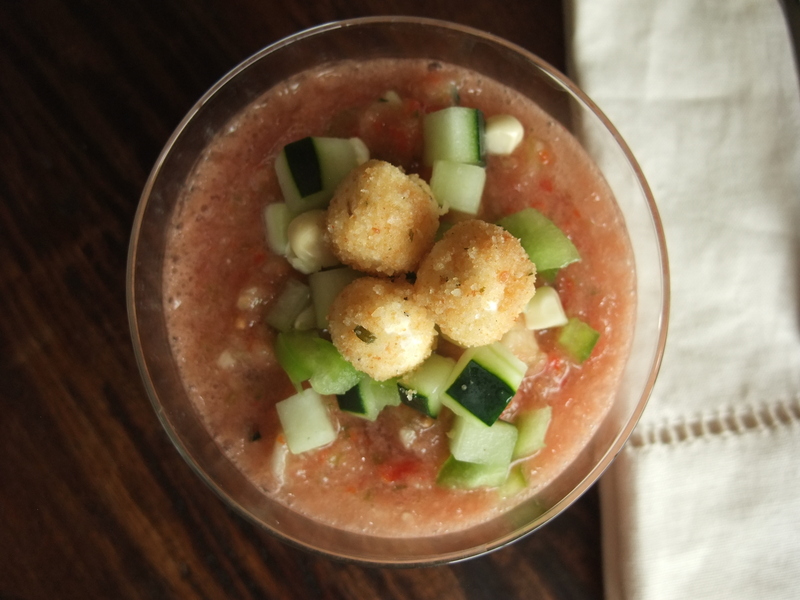 There are many ways to make Gazpacho. Some soups are pureed completely and some are roughly chopped. I like to make mine a bit spicy so I add a touch of jalepeno. I roll cream cheese into tiny balls and coat them with bread crumbs. The cool cream cheese balances the spice from the jalepeno. A perfect combination! Just omit the cheese for a vegan recipe. When making this soup I roughly chop most of the vegetables since they will be pureed in the food processor. However, I reserve 1/4 of the green bell pepper, white corn and cucumber and finely chop those so I can use them as a garnish on top of each soup bowl. In a small sauce pan melt the butter over low heat. Once melted add the bread crumbs. Stir until coated and cook them until they turn golden brown. Remove from heat, transfer to a bowl and set aside. In the bowl of a food processor add all the tomatoes, jalepeno, red onion, garlic and the roughly chopped ¾’s of white corn, cucumber and green bell pepper, olive oil, salt and pepper. Puree until smooth. Transfer to a large bowl. Add ice cold water and sherry vinegar. Cover with cling film and place the bowl in the fridge. Using a melon baller, scoop out as many cream cheese balls out of the 4 ounces as possible. If you don’t have a melon baller, use a teaspoon and remove amounts as small as your pinkie. Roll into a ball using the palms of your hands. Roll quickly or your body heat will melt the cheese. Take several cream cheese balls at a time and drop them into the bowl with the bread crumbs. Shake the bowl around until they are fully coated. Remove from bowl and set aside. Using a soup ladle, evenly distribute the soup between 4 bowls. To get recipe ideas from all around the world follow my company, Dove Concepts on twitter or become a fan on facebook. This entry was posted in Healthy, Meatless Monday, Recipes, Soups, Vegetables, Vegetarian and tagged bell pepper, cream cheese, gazpacho, meatless mondays, onion, soups, spanish, summer, tomatoes. Bookmark the permalink.